With a timeless, yet contemporary design, this toddler bed fits beautifully into almost any children’s room, and it’s the perfect size for a smooth transition from a cot. Toddler beds are a great step in transitioning to a big bed for young children. And for parents it means not having to immediately invest in a new mattress. Toddler beds are also perfect for smaller spaces – and this one certainly doesn’t compromise on style. The Hampshire Toddler Bed is designed with a small child in mind – with its beautiful clean and smooth lines. It’s not fussy, but has a real air of grace about it. The contemporary design also means it works for both boys and girls, and is made from solid mahogany – so it’s built to last. It comes in either a clay or stone colour, meaning you can jazz it up with some bright bedding, or tone it down with muted linen. 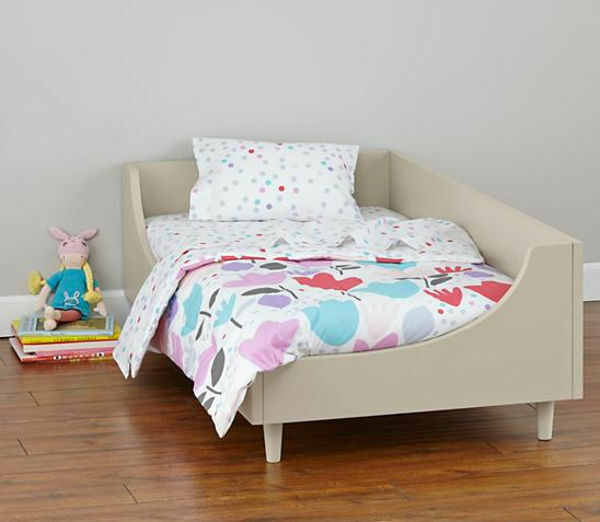 The Hampshire Toddler Bed costs US$399, and is available from Land of Nod – but you will have to make direct contact to discuss shipping to Australia.